Q: How to accept the present moment? 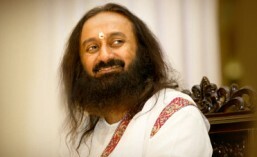 Sri Sri Ravi Shankar: Like now, this moment I have accepted your question, and I am here now. Got it? It is spontaneous. The present moment is inevitable. Whatever exists is in the present moment. Even a future thought is in the present moment. Your future worry is not in the future, it is in the present. Even the past memories are in the present. You can’t escape from the present. Your worry about the past is also in the present. You simply have to wake up and see the present is inevitable, that is all. Sri Sri Ravi Shankar: If you want to use anger for something and it is in your control then it is good. If anger controls you then you are in trouble. Do you see what I am saying? You can use anger as a tool, but if anger starts using you then you lose everything; the cause also is gone. Most people do this. When they want to fight against injustice, they lose it and the very cause for which they are fighting is defeated. In third world countries, and all over the world, they burn buses, burn trains and cause so much damage. Behind every riot, they think they are fighting against injustice; any riot, anywhere in the world. My interpretation for WAR is – Worst Act of Reason. There is a reason for which you go to war. Anyone who goes to war, they will justify the war. But it causes so much damage and doesn’t give you anything. That is why one needs to find alternative ways. Peaceful, nonviolent demonstration is the best, like the Gandhian principles. We did this now in August in India. You must have heard about it in the papers. IAC – India Against Corruption, we are founding members of this. We did this movement without a single act of violence or disturbance anywhere in the country. The Art of Living was the main patron, main source, and all our volunteers made sure that no anti- social elements get into this anti-corruption movement. Standing up against corruption and crime, it could have gone wild. People could have burnt homes, and could have done all sorts of things. But no, there is commitment to non violence. And suddenly, during the whole time, the crime rate had gone down in the country. Everybody was standing up for a cause.